While the original Dodge Viper GTS-R race teams roared onto the racing scene back in the late 1990s with a string of wins, it has taken the 2013 SRT Viper GTS-R teams much longer to stand atop the podium. 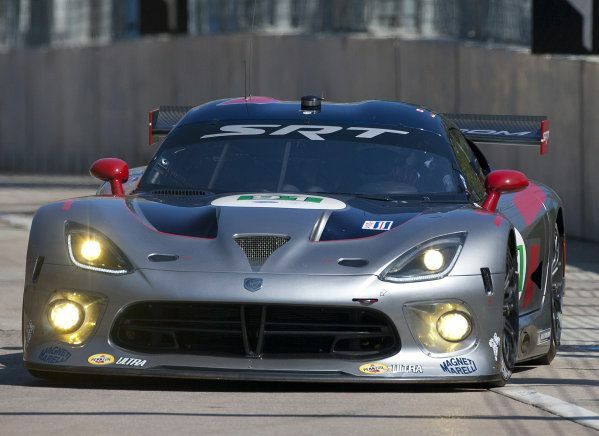 To be more exact, it was just over a year from the introduction of the new Viper race teams until the SRT team claimed their first win back on August 11th but following a strong showing at the event in Canada on July 21st and the win at Road America in August – the SRT Viper teams are beginning to hit their stride. What better way than to try to carry on that momentum than at the Grand Prix of Baltimore where the SRT brand will serve as the presenting sponsor while also offering fans a chance to check out branded displays around the event. As is generally the case, there will be two SRT Viper GTS-R entries competing at the upcoming Grand Prix of Baltimore including the #91 car driven by Dominik Farnbacher and Marc Goossens and the #93 car driven by Kumo Wittmer and Jonathan Bomarito. The #91 Viper driven by Farnbacher and Goossens was the car that took the top podium spot in the GT class at the last event and while that team has been the stronger of the two over the past year, the #93 Viper has shown success over the past few events as well so either one of the two Viper race teams could bring home the class win in Baltimore. However, the win won’t come easy at the Grand Prix of Baltimore GT class is comprised of 11 cars that are all very capable of taking the checkered flag with the most obvious opponents being the pair of Chevrolet Corvette ZR1 race cars driven by Jan Magnussen, Antonio Garcia, Oliver Gavin and Tommy Milner. For this event, the #93 Viper will continue to be sponsored by Pennzoil Ultra while the #91 Viper will wear the logos of the upcoming racing film Rush - a Ron Howard joint based on the true story of Austrian Formula 1 champion driver Niki Lauda. Racing fans will have a chance to check out more on the Rush film at DriveSRT.com along with through social media but for fans watching the action live in Baltimore – the #91 car will wear a unique livery with the Rush graphics. Practice for the Grand Prix of Baltimore presented by SRT begins bright and early tomorrow morning with qualifying scheduled for the early evening. The race itself is set to take place at 3:45pm eastern standard time on Saturday and while ESPN3 viewers can watch the race as it unfolds on their computer or Xbox, those who don’t have access to ESPN3 can watch the race on ABC starting at noon EST on Sunday the 1st.